Ah, Mr Christopoulos, what good things you have bestowed upon Melbourne and her citizens who wish to be nourished by noble traditions of food and coffee service. I hailed the Christopoulos empire recently after eating at Gill's Diner. 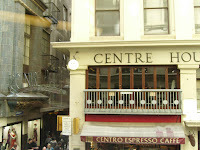 Two of his other establishments are just part of the temple of nourishment, for mind and body, housed in the CAE building on Flinders Lane. Here one can access the City Library (if you don't belong to a library, join one - they are an incredible public institution), or undertake courses in writing, sewing, computers, languages and a cornucopia of other fields at CAE (got some time over summer? Check out their catalogue and enrol in something). The cafe Journal is a regular in Top 5 cafe lists, whether for its coffee, vibe or location. Up a short flight of stairs, Journal's sister venue, Canteen, is a study in resourcefulness. The restaurant is essentially one big room, with stools overlooking the upper level of Centre Place, and an open kitchen displaying gloriously huge pots bubbling with the day's sauces and pastas. 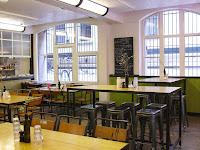 As a restaurant, it's open Monday to Friday, 12-3 pm. In the evening, CAE uses it for its cooking classes. The daily menu consists of an antipasto platter, a soup, three or four mains and a couple of desserts. (A degustation is also available.) It's not flamboyant; it's not showy; and at $15-$20 for the main dishes it's not the cheapest lunch option in the area, but these prices are absolutely the result of the best, seasonal produce in dishes made with a slow food ethos. 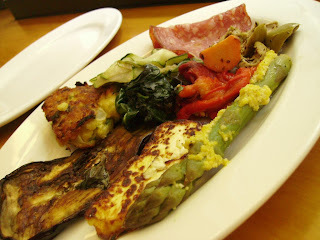 We chose a small antipasto plate: Fried ricotta; marinated eggplant, carrot and capsicum; slivers of delicious, delicately dressed cucumber; frittata; green olives; asparagus; and a lone piece of salami. Nourishment central. 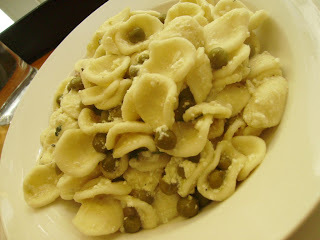 From the mains menu, orecchiette with peas and ricotta seemed the best fit for lunch on a fine Wednesday. This dish could define the worth of making pasta fresh and eating it on the day: the texture is so superior and the pasta contributes much more to the dish than just being a base for sauce. All main meals come with a simple side-salad of dressed lettuce and sliced onion. There's an inviting wine list as well: a couple of sparkling and three each of white and red. They're carefully selected Italian wines, sometimes of lesser-known varietals such as vermentino, but undoubtedly fine examples. The food is of the kind that, even after eating perhaps slightly more than was strictly necessary to merely sate one's appetitie, doesn't leave a feeling of biliousness. Rather, one feels enriched for choosing something of quality that has been handled respectfully.